Start on your knees, sitting back onto your heels. Separate your knees from each other so that there is space to fit your torso between your legs, but ensure your big toes remain touching. On an exhale, bend forward from your hips and bring your torso forward, leading your forehead to the ground. Your torso should rest between your knees. Extend your arms out in front of you, with your palms resting on the ground and arms remaining active and lifted. Ensure that you are releasing your tailbone towards your heels, and continue to lengthen your spine as you deeply breathe in this position. Slowly lead yourself back up to your knees to release. Now that you have an understanding of how to properly perform the pose, here are the top health benefits of Child’s Pose for the mind and body. The lower back can build up a lot of tension in our daily lives, and pain in this area is an incredibly common ailment. In fact, over 80% of Americans suffer from low back pain at some point in their lives. From slouching in our desk chairs to not getting the ample stretching that our body needs, it is easy to feel tightness and discomfort in our backs. Child’s Pose is a wonderful, accessible pose that combats the compression in the back through restorative and gentle stretching. By folding over your legs, you counteract the movement of the tailbone that you typically perform throughout the day. This allows for a deep lengthening and stretch through the spine, and as a result you get a nice release in your lower back. Beyond just targeting the low back, Child’s Pose lengthens the entire spine and allows for a release across the entire back. The spine can be compressed as we move about our day, and Child’s Pose gives the spine a chance to lengthen and mitigate some of the negatively impactful movements it deals with. As you reach your arms forward and push your tailbone back, your spine gets a deep stretch that works against the compression from the day. In addition to the lengthening the spine, it disperses some of the pressure that impacts your spinal discs. In order for your body to function at its highest potential, it is important that you have a healthy blood circulation. Blood carries oxygen and nutrients throughout the body and takes away carbon dioxide and waste from the tissues. Since it is such a significant function, your organs and tissues will function far more productively with increased blood flow. While you may think of more active flows as the best way to promote blood flow, restorative poses can be just as beneficial. Child’s Pose is excellent in increasing blood circulation, as it aids in promoting the flow to the spine, brain, and organs. Bloating and indigestion can cause a lot of discomfort in the body, and can even make you feel sluggish. While it can be tricky to fight the symptoms of poor digestion, certain targeted yoga poses can help the process. In Child’s Pose, the torso rests on or between the thighs, which helps to promote digestion. As you breathe in and out while in the posture, your belly expands and allows for a massage of the digestive organs. This helps move your digestion along, and can help alleviate gas pain as well. 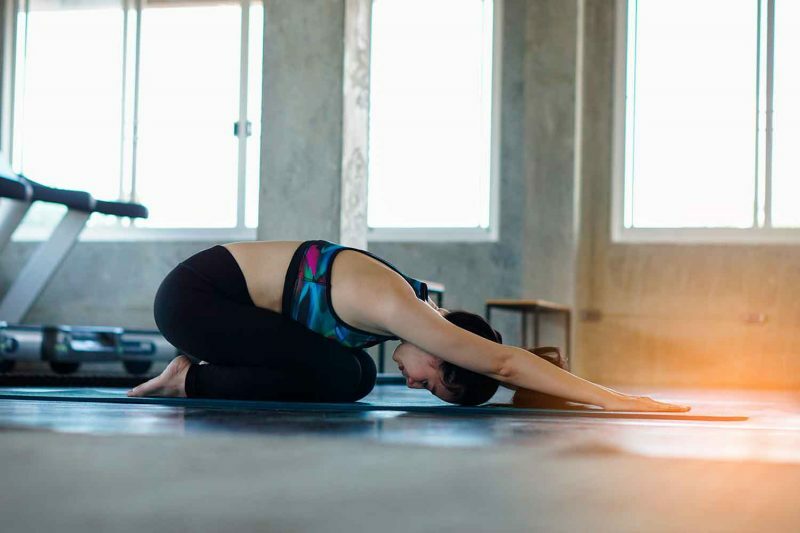 If you really want to promote better digestion and are feeling particularly plagued by symptoms of poor digestion, perform the pose with your knees closer together. This connects more upper thigh space to your torso, and allows for the most impactful massage. Just like our spine and low back, the hips can take a beating throughout the day. In order to combat any negative effects, it is important to target the hips to let them function as well as possible. If you have tighter hips, you’ve probably noticed a very deep stretch in those muscles. The action of widening your knees and bringing your torso forward allows for a powerful opening in the hip muscles. This can help you better prepare for yoga poses that require open and warmed-up hips, can help with alleviating hip pain, and can prevent hip problems in the future. When performing the pose, bring the knees closer together if you feel that the stretch in the hips is too intense. You can slowly work them further apart as you feel more flexible in the hip muscles. Your ankles, shoulders, and thighs can carry a lot of the physical work you move through during an asana practice, so it important to stretch them adequately to prevent injury and allow for the safest range of motion in your practice. Your ankles—which often don’t get a lot of attention when it comes to stretching—get a nice stretch through pressing the tops of your feet into the ground. Your quadriceps receive the much-needed work as you bend your knees and crawl your torso forward. Finally, your shoulders get a deep stretch as you bring your upper body to the mat and lengthen through the spine. As your shoulder blades stretch across your back, you should feel a nice release in this area—which often can hold a lot of tension. The knees can be very prone to injuries, so keeping them strong is the best way to reduce the risk of running into issues during any physical practice you take part in. The ligaments and muscles help to stabilize and support the joints. The stronger the muscles and ligaments that support your knee are, the less stress is put on your knee joint. Additionally, as you build this strength, it is important to stretch the muscles to avoid developing tightness, which can lead to injury. Child’s Pose is an excellent posture that targets these issues, as it both strengthens and stretches the knees. During the pose, if you find that your knees are sensitive and don’t have enough support, you can add a blanket underneath you. This allows you to fully enjoy the benefits of the pose, while still doing so in a way that best serves your body’s individual needs. In addition to massaging the organs that aid in digestion, Child’s Pose helps to massage and activate other organs, including the kidney, gallbladder, pancreas, and more. The gentle massage that you do while performing the pose helps to stimulate the organs, allowing for better functioning. Continue to breathe deeply while in the pose to ensure your belly is expanding and the movement is creating a gentle massage between the knees and the abdomen. Adjust your knees as you see fit to get the best abdominal massage that works for you. Child’s Pose is an excellent posture to practice when you are in need of an energy boost. The posture allows you to release tension as you reconnect to your breath and bring your focus inward, naturally bringing you to a much more energized state. The posture brings balance to both the mind and the body through strengthening, stretching, and connection to the inner-self. As a result, practicing Child’s Pose gives you that boost that you need both mentally and physically to move through the day with energy and focus. While performing Child’s Pose, you are turning inward both physically and mentally. As you bow down to the ground and bring your eyes away from any distracting stimuli surrounding you, you are better prepared to calm down your mind and focus on yourself and your breath. Even when you are in a room full of people, as you are diving into Child’s Pose, you are given the chance to feel quiet, solitude, and comfort. You naturally begin to release stress and quiet the mind as you go deeper into the posture, and a connection with your breath takes the serenity even further. While some yoga poses can be incredibly physically active and demanding, Child’s Pose gives you the permission to rest, restore, and connect with your inner-peace. While you will find Child’s Pose in nearly every yoga class, you don’t have to wait until the next time you head to the studio to reap the benefits of the incredibly restorative posture. Try practicing the pose right after you wake up, or do it as part of your stretching routine after an intense workout. The benefits of balasana are incredible for the mind and spirit, so do your body and mental health a favor and find ways to incorporate it into your daily life.